So I have a recipe blog to post! Sorry for the double post today. I don’t do that too often. This just couldn’t wait! 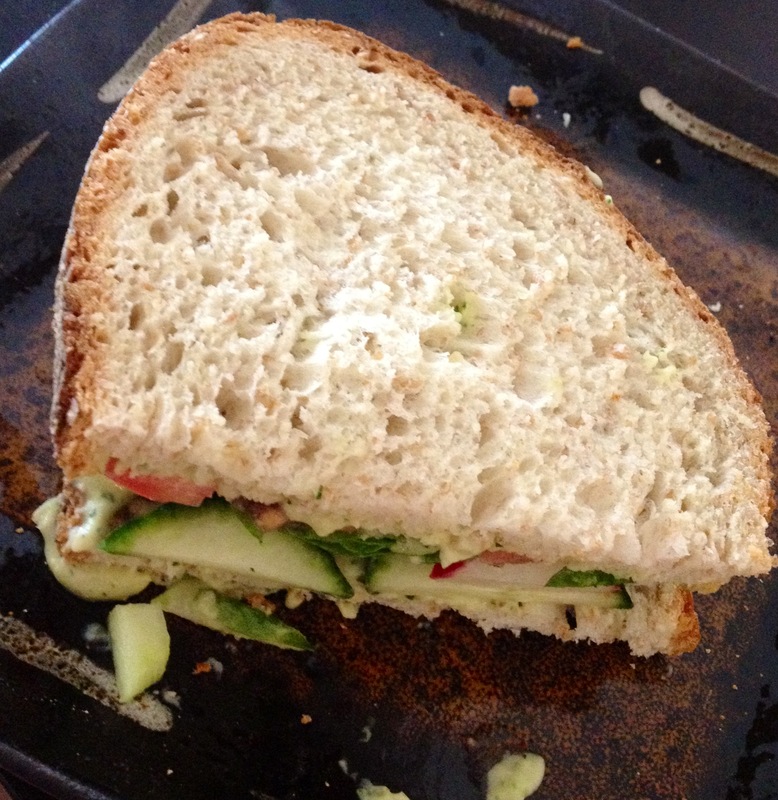 I made a rather tasty sandwich for lunch. I have been having soup for lunch a lot lately. I was just kind of sick of it. But I don’t like to buy lunch meat because of the nitrates and sodium content. Sometimes I grill myself chicken breast but I just wasn’t feeling up to it. Jack also has been on a nap strike this week. So he was already up and whiny. He also barely slept a wink last night. He was up early as well. So with that being said and barely an hour long nap, I needed to think quick. I was also feeling particularly lazy and flat out exhausted. Last week I made Cilantro Lime White Bean Hummus I found on Two Girls on the Go’s blog. I made zero changes. It is a perfectly tasty healthy recipe. I knew I had the ingredients to quick whip up another batch! So I did. Combine beans, cilantro, lime zest, lime juice and garlic in your food processor and blend until mixed. With the processor on, stream in olive oil until desired consistency is reached (about 3 to 4 minutes). Season with salt and pepper to taste and serve with pita chips or bread. I ate it last week with some cholesterol and salt free tortilla chips. It is yummy with bread as well. So for lunch I decided to make it a sandwich. I had no idea how it would be. I was just grasping at straws and hoping it turned out yummy. Spread some on two pieces of whole grain all natural Italian bread. Cut up some English cucumber, arranged it on one piece of bread. And then I had a sandwich! It was delightful! I nearly inhaled it. I stopped myself after eating one half to take a photo of the other half. I was literally chewing the last bite of the first half as I snapped it. I love how simple and easy this is to whip up. If you need a tasty healthy lunch or snack this is your answer! Enjoy!! !